In today’s world, it seems that the female empowerment movement has never felt stronger. Every single day women and men from around the world are speaking up and speaking out in favour for the constant fight of equality. However, despite so many advancements and accomplishments, there still is a long way to go until the world exists as a 50/50 planet. But with the courageous and inspiring efforts of so many organisations and individuals, the realization seems within reach a little sooner. One such woman working towards that goal is USA’s Cassie De Pecol. Famously and boldly known as the woman behind Expedition 196, she was the first recorded woman in the world to travel to and spend time in every single sovereign nation, while also doing it in the shortest recorded time between both men and women. In 2017, she completed the Guinness World Record at the young age of 27 in only 18 months and 26 days, beating out the previous record by over a year. More impressively also is the fact that she set out on this journey and achieved this feat alone as a single female traveller. One initiative and worthy passion project is the need to grow opportunities for women in sport. While De Pecol is passionate about travel, she also is an active and longstanding triathlete and believes that sports can be a way for women to feel better and live healthier and more successful lives. Triathlon is an outlet to achieve all of those things. De Pecol’s love for triathlon seems like the perfect match, as the sport is an institution that works tirelessly for gender equality. The International Triathlon Union continues to push advances for equal opportunities. Under the leadership of the only female International Federation President, Marisol Casado, ITU from its inception, has always offered equal prize money to both women and women, equal distances for race courses, always combined events with men and women races and gives equal space on its media reports and coverage. There are also plans in place to increase the representation of woman across other facets of the sport, for example in the Technical Official programme, it has been stated in the Strategic Plan that more female TOs will be selected to be involved in the Tokyo 2020 Olympic and Paralympic Games than were in the 2016 Rio de Janeiro Games. Training with discipline, hard work and dedication in order to swim, bike and run to finish a triathlon race is the same discipline, hard work and dedication needed to promote change in the world. Which is why women such as De Pecol are the ideal candidates that have the power to use their passions to inspire and advocate both for sport and for peace and equality and can act as a model for how to use all of your passions to help make the world a better place. Currently, De Pecol is training to race in 26 70.3 Ironman competitions this year, with at least 16 of them being held in different countries. So, the demand for her training schedule requires around 7-10 hours a week, where she tends to use her time to focus more on improving her running and cycling since her swim is pretty strong due to her background in the water. On top of that she also has incorporated the importance of strength training, so with the help of her Coach Kim, she also works in VO2 Max training, F45 and the platform Training Peaks in order to reach her goals. While she excels the most in the water, it is the discipline that she enjoys the most. “It’s a great place to train the mind since there’s no one around you to talk to, no music to listen to, no obstacles by means of traffic or stop signs. It’s just you and the water, focusing on rhythm and precision. It’s also the one sport that, knock on wood, I’ve never been injured, and it’s also the least physically taxing on the body in that regard,” De Pecol explained of why she likes swimming the most for triathlon training. Long-distance races are not the only competitions however this year for De Pecol. 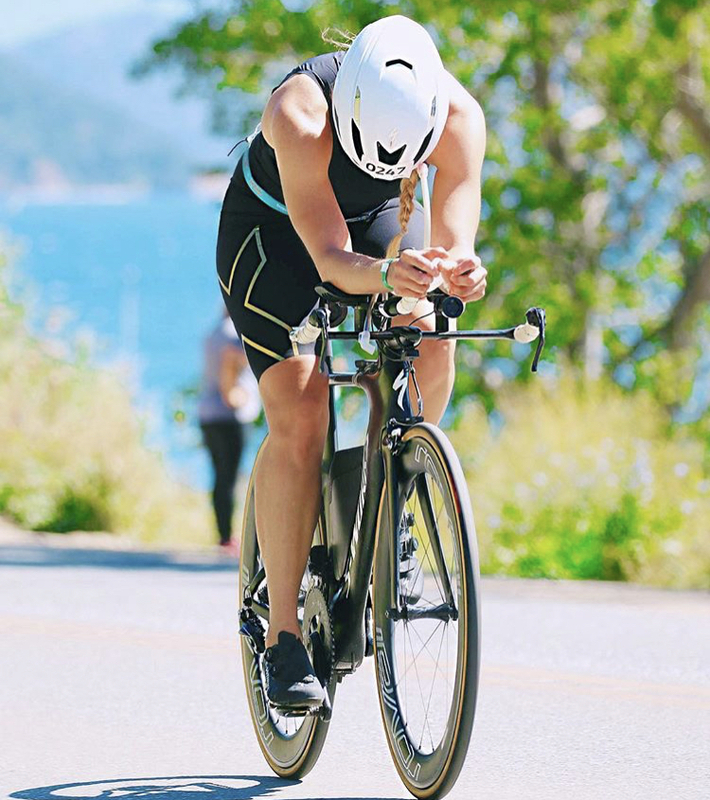 She also is set to race on the Olympic-distance course and will be competing at the 2019 MS Amlin World Triathlon Age-Group race in Bermuda. “I love that I can really challenge my speed and power in shorter distance races. Ironman is more about pacing and maintaining, which can honestly get pretty boring after awhile. There’s nothing like a good sprint to push yourself to the limits and put your training to the test in that retrospect, but Olympic distances are my favourite I’d say. Sprints are fun, fulls are gruelling, halves are good, but Olympics are great,” she said. Competing in sports as a woman does at times enter oneself as being in the minority. While the desire is great to strive for equal representation, the reality within a lot of sports is that the culture still falls short and has a larger male following. Triathlon tries to combat that by providing environments centred inclusivity. “I have always felt welcomed and empowered as a woman competing in triathlon. I know the physical numbers don’t match up, but it’s never felt that way to me,” De Pecol said of her experiences. However, just like today’s society, triathlon and sports in general still have room for improvement to reach gender equality. The truth remains that due to cultural and societal responsibilities around the world, it is a bigger fight to create, find and practice opportunities for women to get involved in a sport. But with that fight comes a beauty in the endless possibilities for women to discover how to break down barriers, stereotypes and obstacles in order to find an activity or sport that they can become passionate about. While travelling solo, one common misconception that De Pecol broke down was that this world is dangerous for a woman to travel alone. In the majority of the places she went, De Pecol felt safe and even was welcomed with numerous acts of kindness, such as one Cuban woman giving up her own bed in order for De Pecol to sleep that night after she forgot to withdraw cash to pay for her hotel. That kindness and that way of thinking is the exact solution for how the growth of women in sport can also help promote global change, because racing a triathlon or participating in a sport gives power, strength and ability for women to not just complete a physical challenge, but also gives confidence to whatever task life has in store for them, especially in parts of the world where those tasks are expected to remain inside the home. On top of the physical benefits that sport can bring into one’s life, there also comes great mental benefits as well, one thing that De Pecol knows to be true as she uses triathlon and travelling as a way to help her struggles with depression. “If there is nothing I can control in the world; people, money, situations, the one thing I have full control over is my body, which is why I find comfort, clarity, and happiness in utilizing it to it’s fullest potential through building it to be the strongest force it can be - both physically and mentally,” she said. While at the root of it all, triathlon can be broken down to simply swimming, bike and running, anyone who has ever participated in a race knows that not to be true, but rather it is so much more than that. It is a culture that bonds people over the desire to not just reach one’s goals but exceed them. And with the goal of gender equality and more opportunities for women, it will be the same, not just reached, but exceeded. With the inspiration and drive of people such as De Pecol along with the thousands of other triathletes and travellers across the globe, more women will have the chance to be encouraged to close the gap on the limitations of what women can and can not do. Because at the end of the day, equality exists within one’s self and believing that they can achieve their goals, embrace their inner strength and make a change.